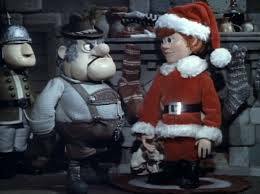 You might recall the character Burgermeister Meisterburger from Santa Claus is Comin' to Town. He was the baddie who hated toys and Christmas. Like, a lot. He said things like, "Toys are hereby declared illegal, immoral, unlawful AND anyone found with a toy in his possession will be placed under arrest and thrown in the dungeon. No kidding!" That was just a cartoon you might say. Well, in real life nobody talks like that, right?